All day Monday & Tuesday one of our crews has been pressure washing a 90,000 square foot community wall in preparation to be repainted. 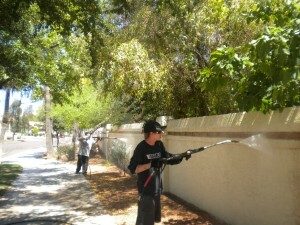 Every year AZ Power Wash Pros pressure washes 10 – 20 miles of community walls; and not always for repainting. After walls or any structure is painted it is recommended to have the area pressure washed to remove dirt, bird droppings, pollutants and other harmful substance that can deteriorate the paint requiring it to be repainted more frequently. Pressure washing will help keep the appearance of your property looking like new and extend the life of the painted surface requiring repainting less often.